same here only recording my voice on all types of call recorder application i tried. Google terminated the ability to record calls, due to privacy concerns, in Android 9. You can still do it but it will require you root your phone. If you want to research it further just google "call recording android 9"
Is there any chance recording will be added in some future stock release?? @jim in pa seriously Google stopped call recording in Android pie.I know there is major countries who banned call recording but didn't idea it will completely terminated by Google on Android one. 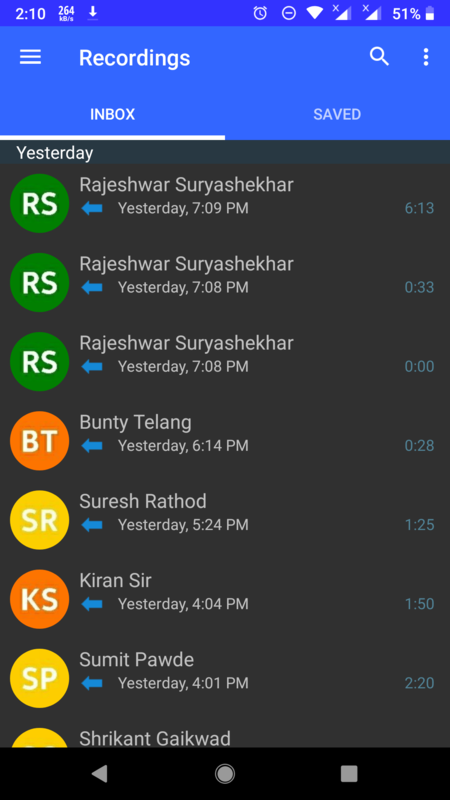 Found One Solution On Call Recording i.e.Use Earphone while calling.It will records all calls i.e.Own and Other Person Voice. @shaizad591 which call recording application you used? I am using call recorder i.e.Set This Battery Settings as not Restricted and Don't Optimize Battery.It working on mine Nokia 6.1 when using earphones on call. look at my call recording screen. I am using nokia 6.1 with latest updates. I am using below app. I am using this call recorder i.e.Set This Battery Settings as not Restricted and Don't Optimize Battery.It's working for me.